Uncertain weather didn’t dampen the spirits of the nearly 600 new graduates of Mount Holyoke College as they gathered in the College’s Field House to celebrate Commencement 2018. The students gathered in their academic regalia, each bearing a single stem of lilies in their class color, red. As proud families and friends looked on, the soon-to-be alumnae filed into their seats. Their mortarboards were bedecked in flowers and feathers, many with messages to friends and family. Some thanked significant people in the graduates’ lives: “Thanks Mom & Dad,” read one. “For Bernice,” said another. Others looked to a bright future: “We have infinite potential,” one declared. In her Commencement address, House minority leader and lifelong Democratic leader Nancy Pelosi echoed the graduates’ optimism and urged them to tackle the world’s issues fearlessly. But rather than pat aphorisms of presumed success, she offered a piece of practical advice: Identify what matters most to you, she told the assembled graduates. Identify your priorities and make a list of goals. “I have confidence in the impatience of youth to work very hard to shorten the distance between what is inevitable to us and to you, and inconceivable to others,” said Pelosi who received an honorary Doctor of Laws during the ceremony. The day’s speeches, biographies and citations are available as well as the full Commencement ceremony video, which can be downloaded. Barbara M. Baumann ’77, the Board of Trustees chair, kicked off the ceremony by speaking of a chance encounter she had had that morning with an alumna who had returned for her 20th reunion from her native India, where she had become a senator. Within moments the two had connected and exchanged contact information. “That’s the next chapter in your Mount Holyoke experience,” Baumann said, encouraging the new grads to connect with the more than 37,000 Mount Holyoke alumnae. Baumann also welcomed Acting President and President-elect Sonya Stephens, who will become the 19th president of Mount Holyoke on July 1. Stephens congratulated the graduates and thanked the thousands of gathered friends and family who supported them through their time. In addition to Pelosi, Mount Holyoke awarded honorary degrees to Sonia Nieto, educator and activist, who received a Doctor of Humane Letters, and Shirley J. Wilcher ’73, a former Clinton administration official and expert on diversity and equity, who received a Doctor of Laws. Nieto noted that she was the second Puerto Rican woman to receive an honorary degree from Mount Holyoke, the first being Felisa Rincón de Gautier, the first female mayor of San Juan, Puerto Rico. The connection doesn’t end there: In April, Mount Holyoke hosted a visit by San Juan’s current female mayor, Carmen Yulín Cruz. Nieto’s advice: become mentors. Push, believe, provoke, support and challenge your peers to do better, to be the best. “I wish you a consequential life and the courage to carry it forward,” she told them. Wilcher advised graduates to bring an eye to social justice into their careers. 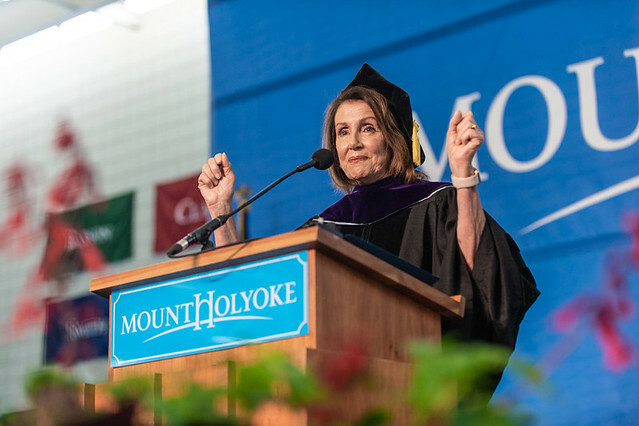 Pelosi noted that with her honorary degree, she joins the ranks of U.S. representatives Nita Lowey ’59 and Richard O’Neill, a former trustee of the College, in their Mount Holyoke connection. “It is my honor to bring congratulations to the Mount Holyoke class of 2018 from the U.S. Congress,” she said. Pelosi also spoke about her personal hero, Frances Perkins, who was a 1902 graduate of Mount Holyoke and became the nation’s first female Cabinet member when Franklin D. Roosevelt appointed her Secretary of Labor. Offered the job, however, Perkins came with her own priorities and ambitions: a list of demands that the president would have to back her on before she accepted the post. That list went on to improve the lives of working Americans by ending child labor, implementing a 40-hour work week, establishing a minimum wage and rolling out Social Security. It was that indomitable spirit that drove Pelosi forward, too, she said, when she was called to run for office. As the mother of five children, Pelosi could not bear the statistic that one in five children in the United States lives in poverty. She outlined her own goals based on her personal priorities: children, health, education, family and safety. As the newly-minted graduates prepared to go out in the world, they had Pelosi’s words to propel them forward and the strength of those who came before them to give them courage.